A new bistro is to open in the heart of Derry city centre next week, it has been confirmed. Bistro at the Warehouse will open next to the Guildhall next Thursday, November 5. The new bistro comes almost three years after the Warehouse Café opened its doors in early 2013 in the shadow of the Guildhall. 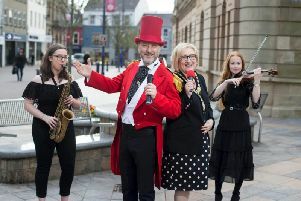 The move comes after Derry recently came second in the Top Foodie Town Awards, and chefs Ivan Taylor (founder of Brown’s Restaurant) and Lisa McClure said they aim to steer the Bistro towards staking its place in Derry’s dining scene. The menu is £16 for two courses and £20 for three. Fully licensed, the bistro will stock premium quality spirits, a range of craft beers including those from Northbound Brewery in Campsie and a concise wine list which has been developed with the help of Mundus Wines. Bistro at the Warehouse is situated next to its existing café and will initially be opening on Thursday, Friday and Saturday from 6.30, (last food orders at 9.30), with live music from the Warehouse Band on Saturday nights in its bar area. For bookings, or to speak to Ivan or Lisa, call 028 71 264 798. It takes over the the Warehouse shop which is moving, in expanded form, to the first floor of the building and taking the new name Above and Beyond.